First, I’d like to apologize for not having any blogs last week as promised. They were all ready to go but I had some technical difficulties, which I thought I’d resolved. Unfortunately that wasn’t the case and I couldn’t fix them in Mexico. Thank you for your messages and emails letting me know you’d missed them. I really appreciated hearing from you. This particular blog now seems like a lifetime ago; however, I feel it’s important to share because that is how I was feeling in the moment. This happened to me a week or so before I left for Mexico. I am surrounded by beauty. A gorgeous view in front of me: Endless ocean with the seagulls, silver in the sky. The water is a dark but friendly blue. The sky is the color of a happy, robin’s egg. The air is fresh but salty…the smell of the ocean which I love so much. I have a cozy, soft blanket wrapped around me. My hands hold a warm, sweet chai. I am sitting, staring off at the view, my senses completely CONTENT, feeling JOY, PEACE and GRACE…a smile appears on my face, a light in my eyes. Then, without knocking, barging in like he owns the joint, arrives my ex. He doesn’t ask to come in, he doesn’t lightly tap on the door to make sure he’s not disturbing me…no, he crashes in like a drunk on a stag night in a stripjoint. Loud. Noisy. Angry. Crude. Totally unaware of my peaceful and happy mood. I tell him to leave but it’s too late. He has sat down, and begins talking loudly, negatively and consistently. Lies. His monologue echoes in my ears like a distorted stadium speaker. I can’t get away. Now, take that scenario and understand that it doesn’t happen in real life….my ex did not just barge into my apartment and start yelling at me. That’s almost worse isn’t it? I sit here feeling happy and content when suddenly he enters my thoughts, totally unexpected and unannounced, and destroys the moment of peace I was just enjoying. It’s so frustrating because IT’S IN MY HEAD!! THEY ARE MY THOUGHTS! That is the place I should have some control over. I decide who enters and who doesn’t. I decide how it looks in there….whether it’s organized, serene or chaotic. Yet, somehow he pushed his way in. He seems to have the secret password to get through and I find myself sinking into the negativity that follows: Sadness, anger, jealousy, disgust, pain, self criticism yet knowing it’s sick, dysfunctional and profoundly toxic. I’ll tell you how you deal with it. 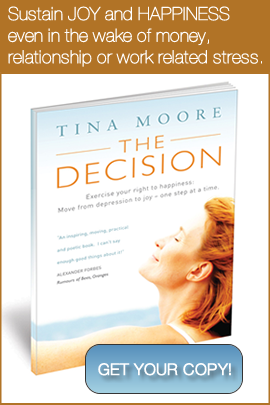 You go to your closet, pull out your running shoes, lace them up, grab some water and walk out the door. You WALK and allow the thoughts of him to push you into an easy STROLL, which slowly turns into a JOG that turns into a RUN and then a full on SPRINT. Wheezing, gasping, spitting, grunting, swearing and possibly even crying you FORCE him out of your head, you POUND him into the pavement and you LEAVE him in the dust. THAT’S how you deal with it. It works. Try it. You’ll be glad you did. 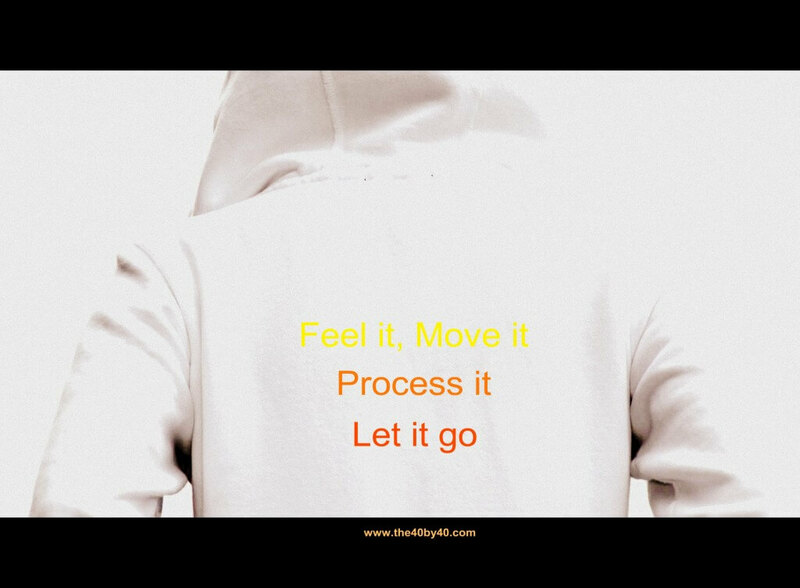 The FEEL IT, MOVE IT, PROCESS IT and LET IT GO saying would make a great t-shirt with your website address. Just like the graphic at the top. You should go and get some created at Dog’s Ear or somewhere similar.